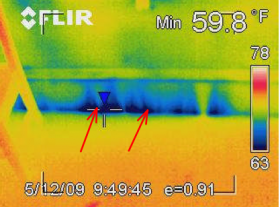 Baseboards often have a gap behind them, between the wall and the floor, that causes drafts (the photos show the infrared photo of a baseboard and the associated cold air infiltration through the board). 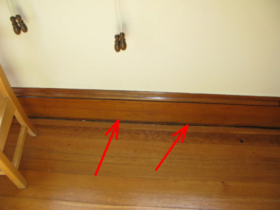 A small gap between the baseboard and the floor can be sealed with caulking. If the gap is large, remove baseboards with a small pry bar (baseboards are generally nailed to walls). Fill the gap with caulking, expandable-foam insulation (which may need to be trimmed with a sharp knife to allow the baseboards to lie flat against the wall again) or foam gap filler rod (eg Moroday gap filler rod). Replace the baseboards. Alternatively, leave the baseboard in place and use foam to seal the gap, then install a thin piece of molding against the baseboard to cover the gap. While it is desirable to seal gaps between floor boards it is difficult to achieve a good long term results. 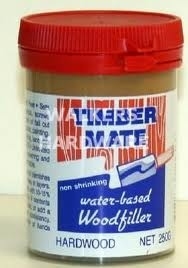 Hard fillers tend to crack and fall out, flexible fillers (eg Timbermate) may be squeezed out when the boards expand. Sikaflex 290 DC (a marine deck caulking product) is recommended by many as the best product, however it is only available in black. 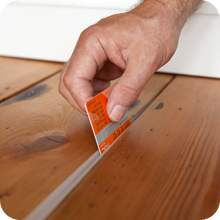 Installing underfloor insulation or using carpet or rugs can also effectively seal floor boards from most draughts. Caulking, expandable urethane foam and Timbermate) and Moroday gap filler rod are available from all hardware stores. See listings in Contacts. Timbermate is available from all hardware stores. See listings in Contacts. Stop Gaps is available by ordering directly on-line. Company is in England..